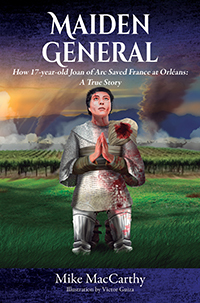 Mike MacCarthy’s “Maiden General: How a 17-year-old Joan of Arc Saved France at Orleans.” This book chronicles every perilous step of Joan of Arc as she runs away from her parent’s farm in France to lead her country to victory over the English at the Battle of Orléans. Joan had no knowledge of war or politics but was determined to succeed and ultimately obtained knighthood. Thank you for your comment and invite. What a great way to get writers inspired to write for Halloween. Good luck to all the writers who enter the contest.